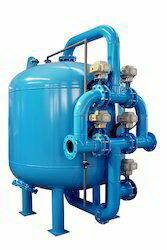 Leading Manufacturer of sand media filter from Ahmedabad. Higher filtration rate 4-6 gallons/ft 2 of filter area/minute. Sand Media Filter is careful management of the filter, the media will remain reasonably well stratified. Maintaining the initial design integrity and thus design performance of the filter depends on careful operation especially management of the backwash process to maintain media stratification. Filter backwash can be a very destructive operation. See Using Turbidimeters to Monitor Backwash below for a complete discussion of backwash management. The more coarse (larger effective size) anthracite permits a higher filtration rate of 4-6 gallons/ft 2 of filter area/minute. This also draws the solids more deeply into the filter media. Solids penetrate to nearly the sand/anthracite interface. The sand tends to provide a margin of safety to stop solids that may penetrate all the way to the sand. This penetration means a much greater volume of solids can be ‘stored’ in the dual media bed than in a rapid sand bed. Utilizing more of the filter bed for storage of solids permits longer filter runs. Operators may claim filter runs of 40, 60, 80 or even over 100 hours! We sometimes wash just because we are feeling guilty. Very long filter runs may reduce the water needed to wash and associated power costs. These savings have very little merit unless the operators are able to prove with frequent (even better, continuous) water quality monitoring that the filter is providing the desired water quality.